We believe in responsible business and as a value led company we continually strive to build and evolve how we interact with our world and the people in it. In the same way, the consumer must also be responsible. People should question the integrity of brands, asking questions about provenance, materials and what role the brand plays in contributing to society. Through a number of initiatives like our collaboration with Positive Luxury, The Set Hotels aims to establish an ethical framework that fulfils an obligation to act for the benefit of society at large, not just for the immediate benefit of the business. By making proactive choices that go beyond the minimum requirements dictated by governing authorities, we can establish practices that take accountability for the company’s effects on environmental and social wellbeing and have a more positive impact. At The Set Hotels we believe that a better world will rely on a global culture based upon collaboration. As such we have partnered with Positive luxury, a community of luxury brands who are conscious of the planet and its future. The interactive Butterfly Mark that Positive Luxury carries, provides transparency, highlighting to consumers which brands they can trust based on what they are doing to better our world. Positive Luxury enable brands to credibly share their sustainability credentials, giving our guests hard-to-find information and insights which in turn we hope positively influences the brand perception of The Set Hotels. You will find the butterfly mark across all hotels of The Set. It is only awarded to purpose-driven brands that demonstrate their positive social and environmental impact, helping consumers shop with confidence. The Butterfly Mark is fully interactive. Just click or tap on the butterfly mark across our websites to discover our Positive Actions, offering insight into our efforts and achievements as verified by Positive Luxury. We have fully restored and rejuvenated heritage buildings in exceptional locations. Each project is a lengthy process that we undertake in partnership with some of the worlds most renowned and gifted architects. From the very start of each project we employ a ‘future fit out evaluation process’ where the potential of the buildings is fully explored in order to minimize the environmental impact associated with the demolition and construction. Tools such as ‘life cycle analysis’ are also employed to examine building material options, determine construction processes and improve supply chain management. This approach has enabled the embodied energy of the development to be measured, whilst also delivering a sustainable supply chain process. The development of Hotel Café Royal and Conservatorium, are both very proud to have attained an excellent rating from BREEAM. BREEAM is the world’s leading sustainability assessment method for masterplanning projects, infrastructure and buildings. It recognises and reflects the value in higher performing assets across the built environment lifecycle, from new construction to in-use and refurbishment. The biodiversity of the development in London has been maximised, the rooftop is a green space and features bird boxes to encourage and attract wildlife. The green roof also reduces water runoff from the site. 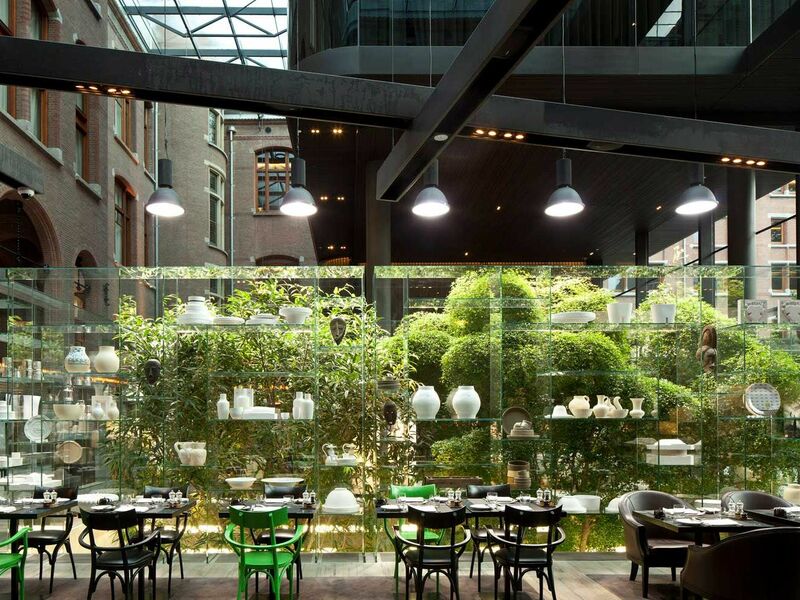 The Conservatorium hotel has been Green Globe certified since its opening in 2011. Green Globe is a worldwide organisation that audits its members according to internationally accepted sustainability criteria. The kitchen team and chefs select locally sourced and seasonal produce as much as possible, always demanding of the highest quality. Using suppliers who pay a fair price to farmers and support sustainable farming and fishing. Suppliers and partners that share similar ethics and approaches to sustainability are preferred and all are required to adhere to our code of ethics. Fully integrated Business Management Systems alerts of any issues or discrepancies in real time via an SMS. This allows problems to be immediately resolved to avoid further damage requiring replacement and impact on guest experience. Windows feature secondary double glazing or tinting for superior thermal insulation. Movement responsive lighting and air conditioning for energy efficiency in bedrooms. Air conditioning in public areas is controlled by timers and set to mirror the opening hours of the spaces. At Hotel Café royal, a central Energy System shared with nearby businesses provide heating, cooling and electricity. One location for a central plant to service multiple sites create efficiencies in scale and energy use. The district system consists of innovative fuel cell technology which enables 350 tonnes of carbon to be saved annually. Significant investment is being made to exchange all light bulbs from halogen to LED. This drastically reduces energy consumption as LED bulbs are more efficient and the air conditioning won’t have to work so hard to cool rooms being heated by the side effect of the halogen bulbs. Heat pumps contribute to WKO storage units located in the back garden of the hotel at Conservatorium to heat and cool, utilising existing energy to create required temperatures to counteract the seasons. The Conservatorium has two electrical chargers for cars in our courtyard. One for Tesla cars, one for other electrical cars. Variable speed drive sensors at Hotel Café Royal react to water usage and adapt the water pressure accordingly to limit consumption. Reduced frequency of linen and towel change to use less energy and water. We encourage guests to reduce their ecological footprint by reusing their linens and towels, maintaining a recommended room temperature and minimizing waste. Reducing the use of single use plastics. Plastic packaging, straws and cups have been removed from our hotels. 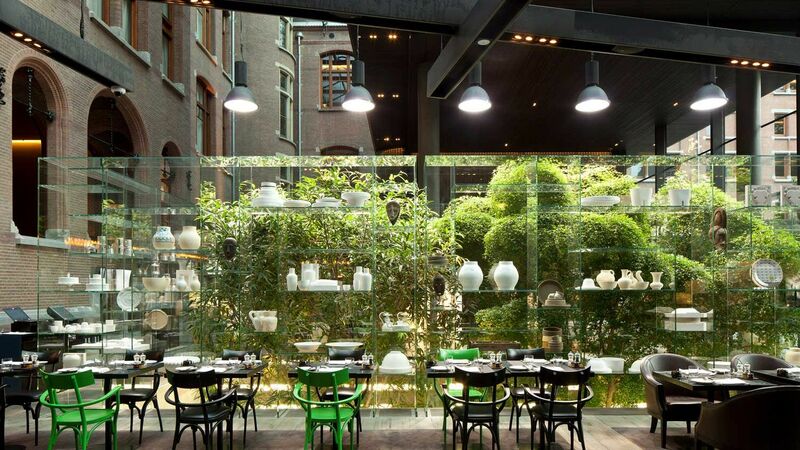 At Hotel café Royal, waste is separated into wet waste, dry waste, recycling and glass. The most environmentally damaging is dry waste as it goes straight to landfill. Through various processes, including key contribution of colleagues, we are gradually reducing the amount of dry waste and raising the amount sent to be recycled. An onsite glass crusher at Hotel Café Royal reduces waste volume by 80%, minimising the frequency of collections required. Fewer refuse collections mean less traffic congestion and pollution caused by vehicles in the area. There is also less noise pollution as crushed glass is quieter to move. Our crushed glass is recycled and reused. A machine dedicated to separating grease that would otherwise go down the drain and enter London’s water ways ensures that Hotel Café Royal is not contributing to the much talked about ‘fatburgs’ found in the city’s sewers. The old grease is collected regularly and in exchange is replaced with fresh oil for use in the kitchens. At Conservatorium, using a baler and compactor to reduce waste volume means that collections are only made when the containers are full as notified by a sensor. This minimises the frequency of collections and therefore the traffic and pollution into the area. Flow restrictors at Conservatorium have reduced water consumption without impacting on the guest experience. This has resulted in a reduction from 20 litres per minute to 7-10 litres per minute. At Conservatorium we participate in the ‘Clean the World’ programme to recycle partially used soap bars and plastic bottles which in turn are donated to those in need. The hospitality industry has a strong record of fairness between genders, however The Set Hotels is committed to reducing gender inequality wherever it may exist. You can view the 2018 Gender pay Gap Report from Hotel Café Royal below.